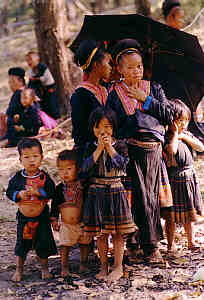 Family of the Blue Hmong (Meo), Hmong Village in Chiang Rai Province, Northern Thailand. The Hmong are divided in two sub-groups, White and Blue, and to be found in mountainous regions of China. Vietnam, Laos and Thailand. In Thailand there are probably about 60000 Hmong people settled in villages throughout a wide area of the north, with perhaps another 50000 refugees from Laos living in camps located near the northeastern border of the country. These ethnic group originates in western China. 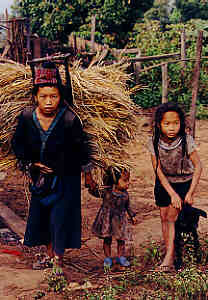 The Hmong live in houses that sit right on the ground, not on stilts as do some other hilltribes. However, the main floor of their houses is not at ground level, but rests upon a kind of above-ground basement or root cellar that they use for food storage. For a long time the Hmong have supported themselves by the cultivation of opium poppy. Most of the Hmong people are turning from opium growing, and are now seeking to market their exquisite needlework in order to supplement their income. Woman with Children of the White Hmong (Meo), Hmong Village in Chiang Rai Province, Northern Thailand. Hmong women traditionally make clothing for their families from cotton or hemp. Their clothing is richly decorated with magnificent embroidery and silver jewelry. Blue Hmong women wear beautiful pleated skirts with bands of red, blue and white intricately embroidered. Jackets are of black satin, with widee orange and yellow embroidered cuffs and lapels. White Hmong women wear black baggy trousers with a long wide blue cummerbund. Their jackets are simple, with blue cuffs. Hmong men make crossbows, musical instruments, and other items of wood, bamboo and rattan. Many of the men are als skilled in blacksmithing and gunsmithing. The Hmong are strict animists, whose shamans use dramatic methods to contact the spirits. So far there have been few converts to christianity or buddhism. The Hmong are diligent and independent people, fond of wearing their silver ornaments during ceremonies and much devoted to the sky spirit they believe has created their own ancient way of life. This page was created on March 21, 1997 and last updated on December 3, 2004. Diese Seite wurde am 21. März 1997 gestaltet und zuletzt am 3. Dezember 2004 aktualisiert.